Habit: Terrestrial. Leaf: basal; petiole < blade, stout; blade ovate to oblanceolate. Inflorescence: at first exceeded by bract, then exceeding bract by peduncle elongation; peduncle < leaves, stout; bract boat-shaped, base sheathing peduncle, partly enclosing inflorescence, deciduous. 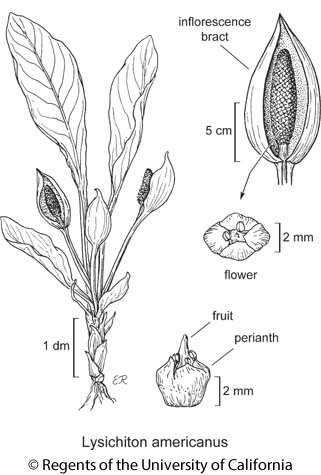 Flower: bisexual; perianth parts 4, fused at base; stamens 4; ovary partly embedded in inflorescence axis, chambers (1)2, 1--2-ovuled. Leaf: present generally in spring after flower; blade 30--150 cm, +- fleshy, midvein thick, grading into petiole. Inflorescence: < 12 cm, +- 2.5 cm diam; peduncle 3--5 dm; bract < 20 cm, yellow. Flower: yellow-green, ill-smelling. Fruit: green-white. Chromosomes: 2n=28. Synonyms: Lysichiton americanum, orth. var. Citation for this treatment: Thomas J. Rosatti & Elizabeth McClintock 2012, Lysichiton americanus, in Jepson Flora Project (eds.) Jepson eFlora, http://ucjeps.berkeley.edu/eflora/eflora_display.php?tid=32349, accessed on April 21, 2019. NCo, CCo; Markers link to CCH specimen records. Yellow markers indicate records that may provide evidence for eFlora range revision or may have georeferencing or identification issues. Purple markers indicate specimens collected from a garden, greenhouse, or other non-wild location.